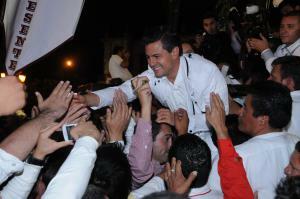 Enrique Peña Nieto on the campaign trail. Photo: Aristóteles Sandoval. Used under Creative Commons license. A $3.7 billion contract to build a high-speed rail link between Mexico city and the city of Queretaro has been canceled after Enrique Peña Nieto, the Mexican president, was alleged to have accepted favors from Grupo Higa, a Mexican construction company that was a member of the winning consortium. Aristegui Noticias, a website run by investigative journalist Carmen Aristegui, recently published details of two houses that Peña Nieto has rented from Grupo Higa businesses owned by Juan Armando Hinojosa, a construction magnate, whose businesses have won numerous contracts from the Mexican government. The first scandal revolves around a 10,000 square feet white house in the upscale Lomas de Chapultepec neighborhood reportedly worth $7 million that is being rented from Hinojosa’s businesses by Angelica Rivera, the president’s wife. The second house – also in Lomas de Chapultepec – was rented out by Humberto Castillejos, Peña Nieto’s legal advisor. Presidential spokesman Eduardo Sánchez says that Peña Nieto merely used the second house as an office “occasionally” before he became president. The relationship between Peña Nieto and Hinojosa’s Grupo Higa dates back to the days when he was governor of the state of Mexico between 2005 and 2011. During that period, Grupo Higa won a series of state government contracts worth $652 million. When Peña Nieto decided to run for president of the country, Eolo Plus, a Hinojosa company, rented him private helicopters and jets to allow him to campaign around the country. Last month, a consortium of companies, including Grupo Higa as well as the China Railway Construction Corporation were awarded a $3.7 billion contract to build a high-speed rail link between the capital and the city of Queretaro 130-miles away. Three days later the contract was canceled to avoid accusations of favoritism. “This is the decision of the president and the essential point is more transparency and clarity, so there is no doubt about the project,” Gerardo Ruiz Esparza, the transportation and communications minister, told the media. Rivera has since announced that she will sell the seven bedroom house.